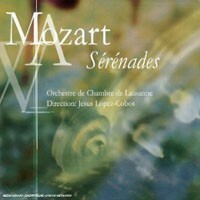 Playing right now in my office is the first of four CDs in the Mozart Serenades boxed set with Jesus Lopez-Cobos conducting the Orchestre de Chambre de Lausanne. There are many recordings of these works, but these have somehow been "under the radar", as Dave Hurwitz would put it. They were all released on the Cascavelle label in the late 1990s to early 2000s. I purchased this from Presto Classical in the UK over a year ago when I was interested in finding the perfect recording of the Serenata Notturna and have come back to it time and again. These are crisp interpretations, nicely recorded. I am a fan of the Orchestre de Chambre de Lausanne. Their recordings with Christian Zacharias of the Mozart Piano Concertos on MDG are quite beautiful. Serenade No. 7 in D major, KV 250 "Haffner"
Serenade No. 10 in B major, KV 361 "Gran Partita"
Serenade No. 13 in G major, KV 525 "Eine Kleine Nachtmusik"
Serenade No. 9 in D major, KV 320 "Posthorn"
Serenade No. 6 in D major, KV 239 "Notturna"
Serenade No. 3 in D major, KV 185 "Pour les noces d'Andretter"